Many students, especially those who return to school later in life, have ample work experience and career-related education, but no college credits to show for it. The same is often true of students who have completed coursework in an alternative or informal environment. Luckily, colleges are becoming increasingly aware of and sensitive to the needs of students who would benefit from alternative ways of earning credit toward their degrees. The CLEP exams are one such method for doing so. CLEP, also known as the College-Level Examination Program, administers exams that students can take in order to earn college credit. CLEP exams assess knowledge in various content areas, and they are accepted at nearly 3,000 colleges and universities. Currently, there are 33 CLEP tests offered. These exams test students on material that is normally presented in introductory-level classes (i.e. those courses generally taken during your first two years of college). They are not available for upper-division coursework. The value of each test ranges from three to twelve credits. Will my school accept my CLEP results? Acceptance of CLEP exams (and their associated course credit) varies from college to college. Some aspects that differ between colleges are the particular tests accepted, the cut-off score for receiving credit, and the maximum number of CLEP credits that you can claim. If you are considering taking a CLEP exam, contact your institution to learn about its exact policy. How should I study for CLEP exams? If you plan to take a CLEP exam, know that there are a number of resources available that can help you do your best. The CLEP website offers practice questions in each subject area, as well as descriptions of each exam. You can also complete CLEP online practice tests or work with a CLEP tutor. 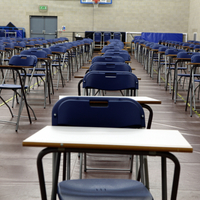 CLEP exams consist predominantly of multiple-choice questions. You will not be penalized for incorrect answers, so try to make educated guesses. You should also try to answer all questions on the test. Before you sit for a CLEP exam, it may benefit you to review basic test-taking skills, such as time management. CLEP tests are timed, and they generally last about 90 minutes. Thus, be sure that any practice exams you complete are timed to ensure you are practicing under genuine testing conditions. This is a helpful guide on how to analyze practice test results. What are the benefits of CLEP exams? There are many benefits associated with taking CLEP tests. By receiving CLEP credit, for example, you can reduce the amount of time you spend pursuing your degree. Earning CLEP credits can also increase the likelihood that you graduate on time or early. In addition, it may reduce the overall cost of your education. CLEP exams are particularly helpful for students who are pressed for time, plan to double major, or have previous experience in a given area. In short, CLEP exams are a terrific way to earn college credit. If you are interested in taking a CLEP exam, speak to your college or high school adviser, or speak with CLEP itself. Contact information is available through the CLEP website.